When I first tried the Bokeh technique for stamping, there were 2 things that I wanted to "fix". 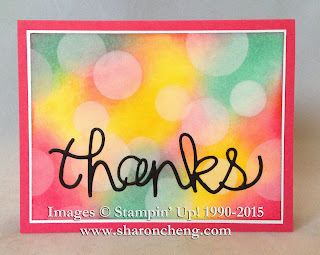 This tutorial shows what I did to "cheng up" the original technique to decrease the drying time and to make sure the sentiments popped against the bokeh background. "Cheng it up" is a term that one of my crafting friends came up with years ago. Because I typically like tweaking techniques and projects, she called it "chenging it up". Sad, but true. I find it difficult to make an exact copy of anything. Inspiration (or lack of ability) usually means I end up with a slightly different version of any crafting project or technique that I try. Do you find that happens to you too? The first thing I wanted to "fix" when trying the bokeh technique with paper was getting things to dry faster. When you use ink, water and watercolor paper, you have a long drying time. Especially when humidity is high as it has been in Fort Worth this spring. The drying time meant that a quick and easy card could take over an hour to make because of waiting for the paper to dry. 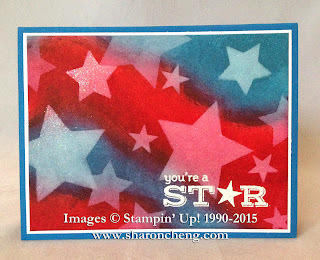 While I could use Stampin' Up! 's heat tool to speed things up, I wanted to teach this technique to my stamp club. The thought of 8 people waiting to use a heat tool inspired me to come up with something else. Secondly, when you use black ink or embossing powder in the earlier steps for this technique, it ends up with a grayish color in the areas where you add the white craft ink. I wanted my sentiments to pop against the background and felt like the black/grey colors didn't work. I found two ways to fix the problem. 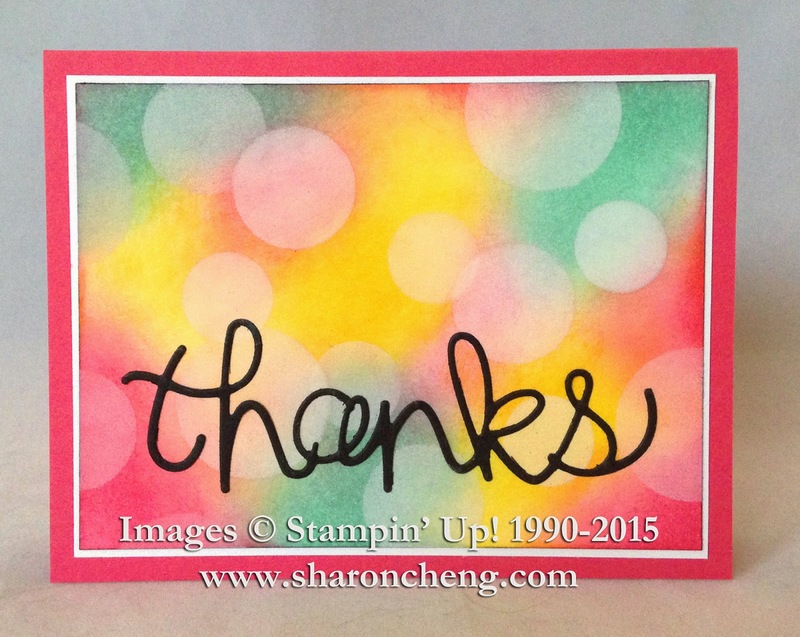 With this card, I used the die cut "thanks" from Stampin' Up! 's Hello You Thinlits (137363 $25.00). I also found that if you use a dark background, you can use white embossing powder to make your sentiment stand out. The white craft ink didn't show up on the white embossed image. You will want to be careful to keep the background around the sentiment mostly dark colors. Bokeh is quick and easy if you don't count the drying time. My stamp club loved the technique. If you are making several cards at once, do step 1 on each card, then step 2, etc. It goes quickly since each card will be dry by the time you get back to it. This turned out so amazing--I love the way you created the flag with the color wash and then used the stars for the bokeh effect. very creative! I like the striping underneath the bokeh stars...great take instead of the expected circles. Very strong looking card. Awesome patriotic card! Love how you created the flag! Thank you for joining our Challenge at the House of Cards. 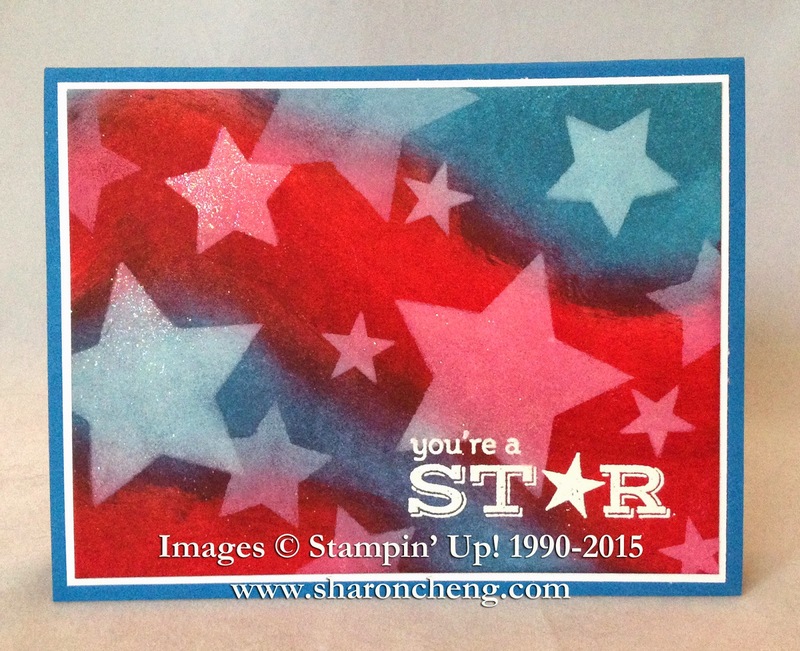 I love this patriotic card! Thanks so much for joining us at House of Cards. Sorry I was late in posting my feedback!